Not everyone is on the light side of the Force. It’s not that people want to be bad, but sometimes they get caught up in what their governments want them to do and they don’t see a way out. But then again, maybe some people like being bad more than we think! If you've spent years training at the Imperial Flight academy, now's the time to finally take the helm of your Tie Fighter. 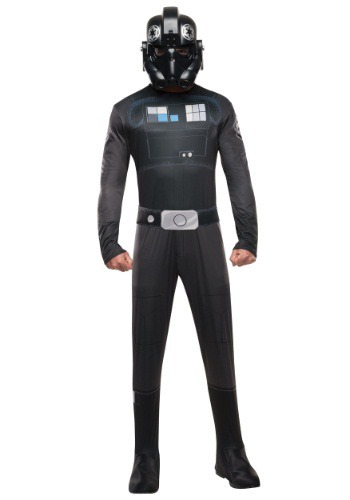 With this costume you'll be ready to battle Rebel Scum in outer space and look good doing it. Now, don't worry about the fact that The Empire puts next to no armor on their starfighters. We're sure with all of the time and energy they invested in you, they're going to give you one of the tip top latest model Ties! Outfit yourself with this Star Wars costume and those X-Wings won't stand a chance against you. This officially licensed Star Wars Tie Fighter costume makes a great solo pilot costume, but it also goes great with a Star Wars group costume for Halloween. One pilot is great, but more is always better - it gives you a bit of reassurance at least. This 100% polyester jumpsuit is printed to match the classic Tie Fighter jumpsuit and has a Velcro closure in the back for a comfortable fit. The jumpsuit also has attached foam shoe covers that stay secure with an elastic band that goes under foot. A foam belt completes the jumpsuit and has Velcro closures. Top it all off with a Tie Fighter mask with netting over the eyes and an elastic band to keep it in place no matter what crazy flying stunts you get involved in this Halloween.